Welcome to the first issue of Paper Planning Magazine! First and foremost, I want to thank all of you for your support, your encouraging words, your generosity, and your kindness. This idea has been in the works for quite some time, and it would not have come to fruition if it hadn’t been for all of you buoying me up and helping me along in this last month. This is an idea still in its infancy; I have big plans for this little magazine! Launching in the same month that school started and we moved the first Frat Boy to go away to college (rather than attending locally) might not have been the most sane idea, but you all kept me motivated every step of the way. As this is the first issue, I hope you’ll all let me know if there’s anything amiss with the site in any way, and I thank all of you in advance for your patience as I fix any of the issues that might arise. A great way for you all to see what I’m working on adding to the site. To keep me accountable in getting those things done. A place for you all to see that the suggestions you’ve made have been added to the list. If there are any features you’d like to see on the site or any topics you’d like to see covered in articles or videos, feel free to send an email to suggestions@paperplanning.com and let me know! When you look at that In The Works page, you’ll see one of the items listed is a Resources section for the site. I’d love to list planning resources of all kinds — planning websites, products, insert shops, sticker shops… anything we planners would love to use! 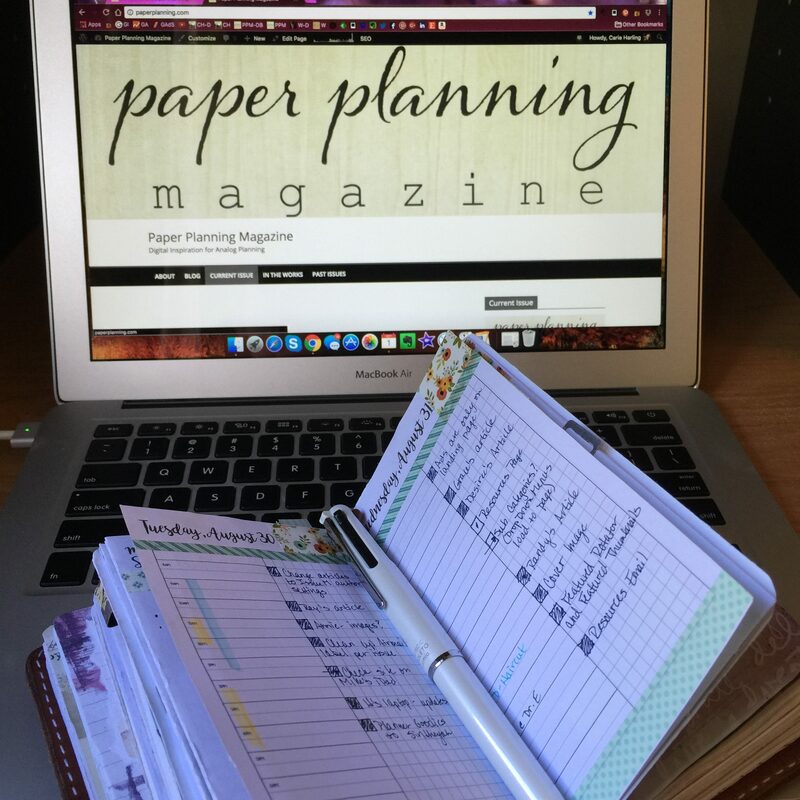 If you have a shop or a website that you’d like to see listed in the Resources section, simply send an email to resources@paperplanning.com and I’ll add it to the list! I hope you all have as much fun perusing this first issue as I had making it. I’m already working hard on the October issue; don’t forget to send your submissions for publication! Thank you! Things still aren’t looking the way I want them to look, but the only way I could mess about with that was to set it Live and then tinker. 🙂 I very much appreciate your support, Grace! As someone still struggling to get it all together this is awesome. Thank you. I love what you’ve done so far. Great job!!! Maybe one day I will contribute a post or two. I’m so looking forward to the next issue!! Thank you! Yes, you absolutely should send a submission!! Congrats Carie! Looking forward to reading everything. Looks great on my iPad! Easy to navigate around. Lots of cool things to explore! Awesome job, Carie! So far so great! I do like this, I am looking forward to future issues. Proud of you and your accomplishments. Congratulations! We’re gonna have a lot of fun here! Is there guidelines btw for submissions? For example maximum word count, size of photos submitted etc? Thank you! I’m not currently setting any submission guidelines other than making sure that the articles have photos and that I have permission to use those photos. 🙂 The way I see it, short articles are great for when you just have a few minutes to read, and longer articles are great for when you want to sink your teeth into something. If I refrain from setting too many guidelines, we should have a good variety of articles. As far as photo size goes, I’m currently able to make pretty much anything work (I say this as I’m still arguing with *one featured image* in this issue). Please, send your submission! I would love to read it. Congratulations on a great idea and great magazine! I think it fills a void in the planner community. Thank you, Anita! Filling that void is my goal… I’m tickled to hear that so far we’re going in the right direction to filling that void! I really, Really like this online magazine! I’ve used a planner of some kind ever since I got my first grown up job. Sometimes it was only a month-at-a-view purse/checkbook calendar – up to a full on REAL FranklinQuest Classic with a zip closure. I’m now downsized into a widened standard VDS to hold my FranklinCovey compact WO2P. …. All that to say, I have really enjoyed reading the articles you’ve gathered for this magazine, and I’ve been introduced to new ideas, and reminded of old strategies I’d once used, forgotten, and realize would be helpful now. Thank you for taking the time and making the effort and commitment to this online issue! What a great idea! I am so looking forward to reading this magazine, and participating where I can! Great first issue – excited to see where it goes 🙂 Thank you for all the hard work!